This list includes readings that explicitly speak out against capitalism, how it functions, and what to do about it. All the books under Anarchism could fit into this category, but I think this category must remain distinct. The fight against capitalism is a multi-front, multi-ideological battle. This list reflects that multivalent structure. 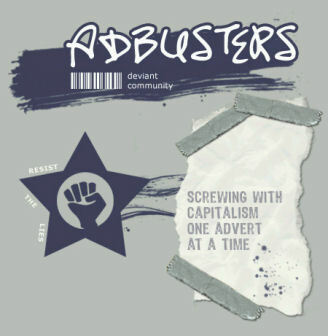 Adbusters consistently publishes works that inspire and challenge. They seek to be holistic in their critique of the system, but they focus on how corporations have used imaging to coerce a religious faith in capitalism, neo-liberalism, and all that results from those ideologies. They seek to combat the slogans of the corporate giants with memes that tell truth rather than produce consumers. I subscribe to them, and I love their content. If you cannot afford to subscribe to them or you do not wish to, more than likely you can find them at your local library. This tour de force may be one of the greatest apocalyptic books of our day. It reveals consumer ignorance of the very brands they devote themselves to. No Logo shows how the modern multinational corporation concerns itself very little with actual products. Instead, these corporate enterprises focus on advertising and branding (think cattle branding of products). They use marketing to manipulate people to self-identify with their products. This turns brands into lifestyles rather than actual products for usage. This creates lifelong consumers who will buy simply to maintain their devotion to the brand that defines them. I look at the world throughout an entirely different lens now, and I am still yet to finish the book! It is that revolutionary. Again, a must read.